The U.S. Education Department’s Office for Civil Rights conducted a survey of the 97,000 public schools and 16,500 school districts in the United States, revealing racial and gender-based achievement gaps. The survey found that males of color are even more impacted than females of color. In light of systematic inequalities, some argue that not only does affirmative action not address the root of the education gap, but it also sets students of color behind. In his book “Mismatch: How Affirmative Action Hurts Students It’s Intended to Help and Why Universities Won’t Admit It,” UCLA law professor Richard Sander writes that placing students in educational environments they are not prepared for could discourage them and in some cases, cause them to drop out due to learning, competition and social mismatches. 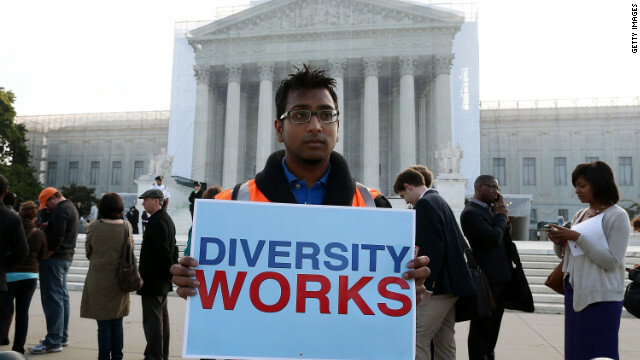 Sociologist Roxanna Harlow says that students of color are often overlooked due to discriminatory admissions processes or poorly funded schools and “the immediate assumption that affirmative action causes schools to admit students who aren’t qualified” is a common misconception. “Property taxes drive the force of public school funding, which segregates neighborhoods by income and race. Because of that, racial and ethnic monitories have higher concentrations of their populations living in poverty and attending under-served schools,” says Harlow. In schools with less resources and less qualified teachers, students might have lower test scores, little or no access to Advanced Placement courses, and less access to extra-curricular activities. Also, those who need to work due to a lack of finances can be prevented from getting internships and other educational experiences. Jennifer Gratz has led the fight against affirmative action since she sued the University of Michigan in 1997 for being rejected from the Ann Arbor campus, arguing that she was rejected because she is white. In 2003, the Supreme Court ruled in Gratz vs. Bollinger that the University of Michigan’s affirmative action methods were illegal and on Tuesday, Michigan’s ban on affirmative action was reaffirmed in Schuette vs. BAMN. Gratz supports a university’s consideration of a student’s socioeconomic status in the admissions process but believes that racial consideration is discriminatory. “The truth is, universities make all kinds of exceptions. If daddy gave a lot of money, you’re in. The ruling is saying that universities can make any exceptions based on any qualifications they want unless it’s a program that benefits black and Latino students,” says Washington.